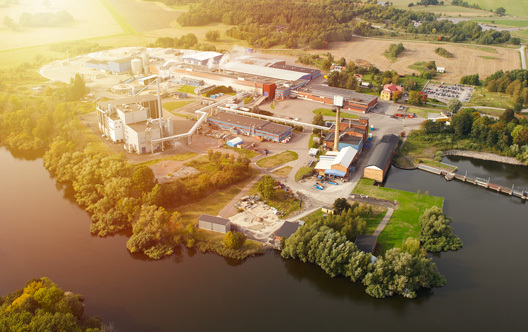 Fiskeby was founded in Norrköping, Sweden in 1637 as one of the first paper manufacturers in Europe. Today we are the only company in Scandinavia to manufacture packaging board made of 100% recovered fibre. Our product is Multiboard. For us it is not just about what we do, but also how we do it. Earth gives us the resources we need to develop our strong packaging board and deliver it across the continent. To ensure that we protect these resources for future generations, we approach our manufacturing in an eco-friendly and sustainable manner. The production of Multiboard is based on sustainable cycles. By taking advantage of the strongest fibre in cartonboard that has been used once, we save on Earth’s resources and energy. Recycling provides clear environmental benefits and is fully in line with today’s sustainability requirements. To further reduce our environmental impact we use renewable energy. We are self-sufficient in steam and produce approximately 30% of our electricity needs. Since 2015 we also have our own biogas plant to clean the process waste water. Fiskeby Board AB is an independent company with all manufacturing based in Fiskeby, Norrköping. Sales offices are located in Sweden and several countries around Europe. We have a strong owner in Fiskeby Holding LLC, USA, under the leadership of the Coors family. The owner family also operates CoorsTek and Coors Brewery. We manufacture packaging board and deliver strength, quality and service to customers in Europe. We contribute towards a sustainable society by using recovered fibre and renewable energy. The core values are the basis of our culture and affect everything we do. We show respect for each other and understand that our differences are valuable to create a winning team. We take responsibility for our work and never compromise on quality. We are proud of how we solve our tasks. We act when we notice problems. We are results-oriented and do our best to satisfy our customers. We dare to adopt new challenges and strive for continuous improvements.